You can import a tab-delimited text file of abbreviations by choosing File > Import > Import abbreviations…. This feature allows patient instruction abbreviations to be loaded into mSupply so that they can be used in Dispensary mode. It is accessed from the File menu by choosing Import abbreviations. You may import the list of abbreviations used for patients' directions - e.g. the abbreviation tid would appear on the label as three times daily . Your list should be in the format of a 2-column spreadsheet, saved as a tab delimited file. 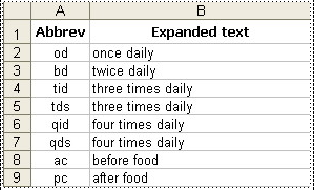 The first column should contain the abbreviation, and the second column should contain the expanded text as it should appear on the label.